Performers include: Beverley Mitchell, Stephen Collins, Catherine Hicks, Mackenzie Rosman, David Gallagher, Barry Watson, Jessica Biel, Lorenzo Brino, Nikolas Brino, George Stults, Tyler Hoechlin, Adam LaVorgna, Christopher Michael, Rachel Blanchard, Ashlee Simpson-Wentz, Jeremy London, Scotty Leavenworth, Haylie Duff, Chaz Lamar Shepherd, Kyle Searles, Sarah Thompson, Alan Fudge, Geoff Stults, Andrew Keegan, Maureen Flannigan, Matthew Linville, Andrea Ferrell, Colton James, Sarah Wright, Deborah Raffin, Nicole Cherié Saletta, Andrea Morris, Graham Jarvis, Sarah Danielle Madison, and Ed Begley Jr. This family drama series focuses on the lives of Reverend Eric Camden (Stephen Collins), his wife Annie (Catherine Hicks) and their seven children. The Camden kids include Matt (Barry Watson), Mary (Jessica Biel), Lucy (Beverley Mitchell), Simon (David Gallagher), Ruthie (Mackenzie Rosman) and twins David (Lorenzo Brino) and Sam (Nikolas Brino). As the kids grow up and leave the household, the series cast expands to include friends and extended family members. Each episode typically touches on a moral lesson or controversial theme. To celebrate Eric’s clean bill of health, he and Annie receive a “Got Well” gift from the Colonel — an RV. They aptly name it “7th Heaven” and decide to put it to good use. They make plans to get away and see the country. But Lucy and Kevin are uncertain about leaving the congregation behind as well as the offer to move to Crossroads. Meanwhile, Jane, Margaret and Mac are very thankful for all that Eric has done for them. They want to join him and Annie on their trip. Eventually, Lucy and Kevin realize that their place is with the family and climb aboard. In the show’s final moments, an RV full of Camdens, their extended family, and a mysterious stranger (possibly God?) head out to see America. First aired: May 13, 2007. • The series was going to be cancelled at the end of season 10. But, when the WB network looked at the show’s ratings for the year, including the very successful last episode of the season, they decided to bring it back for another year on the new CW network. Due to budget cost-cutting, not all of the actors appeared in every episode of season 11. • The season 10 finale featured a wedding ceremony and a reunion of the original Camden family. The actual series finale didn’t have any special reunions or appearances. Of the two, Collins prefers the latter. • Collins, Hicks, Mitchell, Rosman and Happy the dog are the only ones to appear in all 11 seasons of the series. • Collins and Mitchell are the only two castmembers who appeared in every episode of the show. 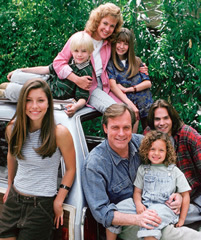 7th Heaven: Will Camdens Reunite for Last Episode? I’m gone to convey my little brother, that he should also pay a quick visit this blog on regular basis to take updated from newest news update.